Kampong Spirit: Gotong Royong, Life In Potong Pasir 1955 to 1965. Kampong Spirit - Gotong Royong is a heart-warming recollection of life in the little village of Potong Pasir in Singapore during the years 1955 to 1965. In this book, Peranakan author, Josephine Chia brings us into the world of her childhood in a kampong. Though deprived of modern comforts like electricity or running water, her multi-racial neighbours lived harmoniously with each other in their attap homes, and had a wonderful zest for life and a strong sense of community. This vibrant kampong spirit or gotong royong, was a significant aspect of living in a kampong. The period 1955 to 1965 was also a dramatic era for Singapore. As the country struggled towards nationhood, the social and political events of the time are seen through the eyes of the common folk. This collection of delightful, real-life short stories will take you through Singapore’s history and heritage at a human level. For some, it will be a journey of discovery and for others it will be a time of reminiscing for those nostalgic years. 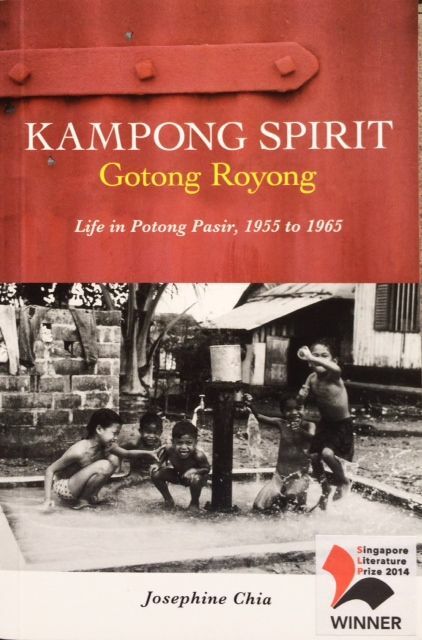 Kampong Spirit: Gotong Royong/Life in Kampong Potong Pasir 1955 to 1965 won the Singapore Literature Prize for Non-Fiction 2014.